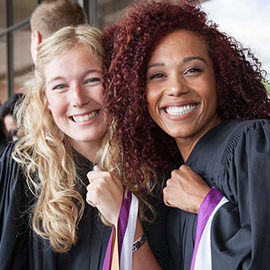 WATERLOO – Wilfrid Laurier University will hold its fall convocation in Waterloo Oct. 27 and 28 and in Brantford on Nov. 1. Eileen Mercier will be installed as Laurier’s incoming Chancellor during the Oct. 28 afternoon ceremony. As of Oct. 17, approximately 1,371 students had met all program requirements and qualified to graduate. Laurier expects to confer 363 graduate degrees, 1,001 undergraduate degrees and seven diplomas. Waterloo campus ceremonies will be held at the Waterloo Memorial Recreation Complex and the Brantford campus will host its fall convocation ceremony at the Sanderson Centre for the Performing Arts. Joe and Stephanie Mancini, founders of the Working Centre, will receive the Order of Wilfrid Laurier during the Oct. 28 morning ceremony. The Order of Wilfrid Laurier honours worthy recipients who have a record of exemplary and distinguished service to the university. Oct. 27, 2 p.m.: Jonathan Okun, instructional assistant at the Lazaridis School of Business and Economics, will receive the 2016 Teaching Assistant Award of Excellence in the undergraduate category. Oct. 28, 9:30 a.m.: Stephanie Grella, graduate teaching assistant in the Department of Psychology, will receive the 2016 Teaching Assistant Award of Excellence in the graduate category. Oct. 28, 2 p.m.: Jennifer Long, instructor in the Department of Anthropology, will receive the 2016 Wilfrid Laurier University Award for Teaching Excellence for part-time faculty in the category of Early Career. View the live stream of convocation.